Last week in group, we learned about the Karpman Drama Triangle. There is some fascinating background on the origin and uses of the triangle, but for the purposes of this blog post (because it might go on forever and never go live otherwise), I will stick with the basics. 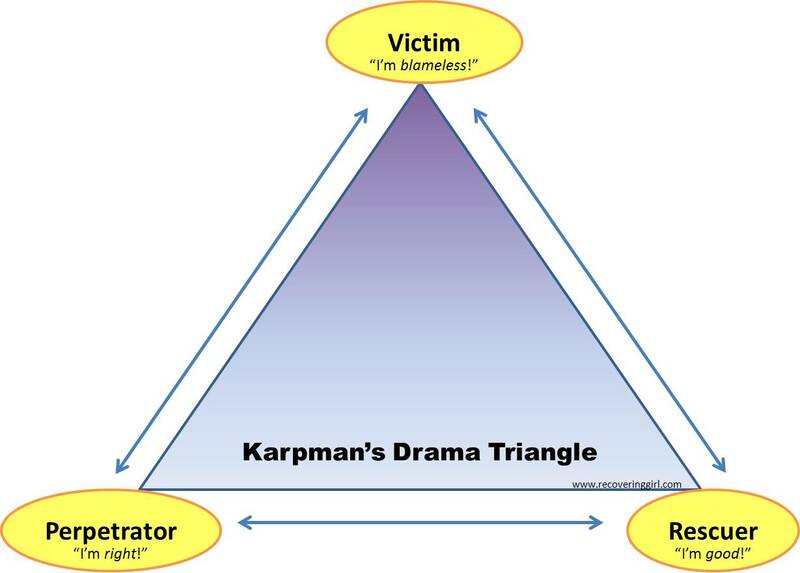 The Drama Triangle has three interconnected (read co-dependent) “players”: The Perpetrator (sometimes referred to as prosecutor or persecutor), The Victim and The Rescuer. You might recognize the Perpetrator/Victim dynamic from the assertive communication post. Aggressive communication would be the Perpetrator’s role, passive communication would be a victim position and passive-aggressive communication is what keeps the Perpetrator and the Victim connected and, frankly, what turns a Victim into a Perpetrator (by trying to manipulate a response) and a Rescuer into a Victim (by expecting gratitude or some other kind of repayment). Then the Rescuer becomes a Perpetrator (because s/he resents being taken advantage of) and the cycle just goes on and on. Jokes aside, as I was retelling the story of my assertive communication empowered moment, I started recognizing parallels to the things that frustrate me most about my mother (insisting on victimhood, not taking responsibility for herself and any suffering she caused/causes, absolute refusal to be based in reality). And then I realized that, like Clark Kent, I need the victims, in order to be the rescuer, which is somehow tied to my self worth (that’s an inquiry for another day) and then I DEEPLY resent the fact that I put my own needs last in order to save someone who doesn’t even appreciate it, or worse, manipulated me into doing it. In my family dynamic, I have always been the responsible one. The adult. The rational thinker, who considered the consequences before acting. And I have learned to identify so much with saving the day, I have continued to give my mother and friends the security of knowing that if they didn’t do it (whatever “it” was), that I would take care of it, because I have been afraid of the consequences of walking away. Not to ramble on about this for too long, but even after learning about assertive communication and how to get out of the drama triangle, I am making excuses, mentally resisting. I still struggle with asking for what I really need, because of the possible (real and perceived) consequences and rejection of not getting it. Maybe the resistance is caused by the fact that I need this rescuer role for my self worth, at least until I can find a new dynamic to replace it. This is a great segue to my next topic (coming soon): the struggle between my rational thoughts and my emotional (and stubborn) “inner child.” It sounds very multiple personality, but it continues to make more sense to me as I go through the work, and how this struggle is making the eating disorder dig in its heels. 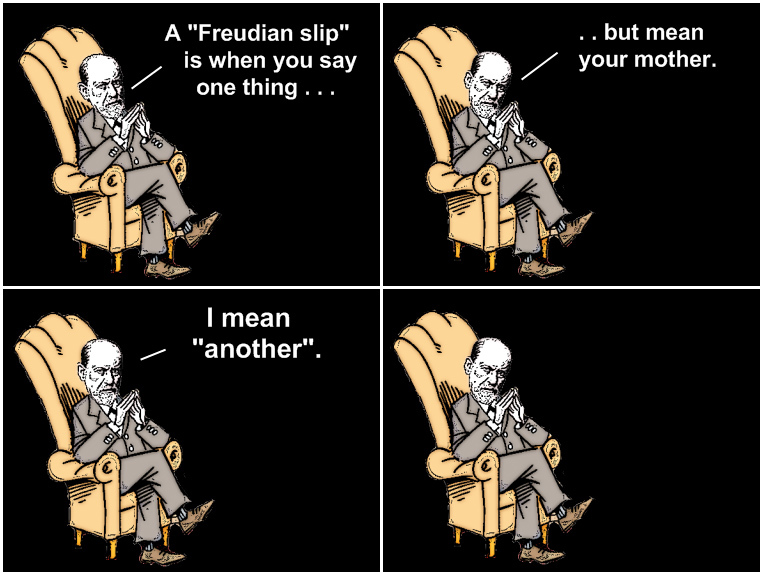 This entry was posted in Uncategorized and tagged codependence, disordered eating, family relationship, Freudian slip, karpman drama triangle, mother, passive aggressive, perpetrator, recovery, rescuer, victim. Bookmark the permalink. I TOTALLY get the digging in heels part. My little kid gets terrified when I make progress. It is like she is being disloyal by getting better and that TERRIFIES her. Just breathe. And put one foot i front of the other. This happens when you are ready and when it is supposed to and not a minute sooner.